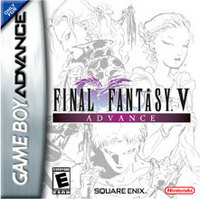 After having released in both Japanese and European territories already, it was only a matter of time before Final Fantasy V would make its way to North America. And so it has... or at least will be, according to a new rating by the ESRB. Joining Final Fantasy VI as an upcoming PS1 classic, it looks like fans will be able to download the job-class oriented RPG sooner, rather than later... provided the PlayStation Store returns in due time. With E3 on the horizon, it only makes sense that an official announcement will come there, if not sooner. Stay tuned for more!